Recently, a new video has surfaced on YouTube where famous YouTuber JerryRigEverything has released a complete tutorial on how to make the back panel of Galaxy S8 transparent. Making the back panel transparent exposes all of the internals of Samsung Galaxy S8. Well, the world has just seen Samsung Galaxy S8 and Galaxy S8+ both of the smartphone carries impressive design and awesome specifications. Samsung Galaxy S8 lineup carries a smooth design and infinity display that covers most of the front panel. Well, YouTubers have started doing Galaxy S8 teardown videos and drop tests. 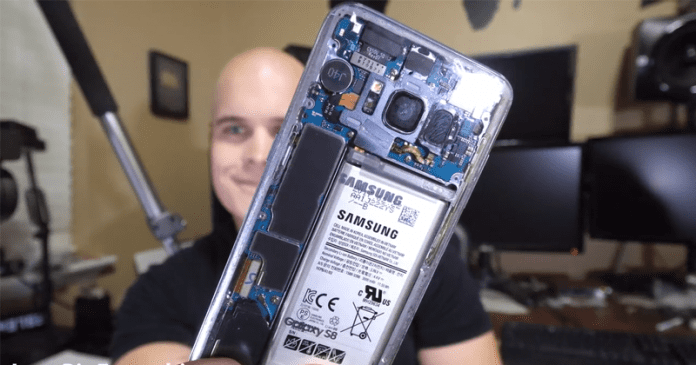 Recently, a new video has surfaced on YouTube where famous YouTuber JerryRigEverything has released a complete tutorial on how to make the back panel of Galaxy S8 transparent.